Very basic apartment located in the beach of Pals, just 150 meters from the beach andthe city center. 1st floor without elevator. It has 2 double bedrooms (1 with double bed 160 x 190, and the other with double bed 145 x 190 + 1 bed 90 x 190), a living-dining room-stay (TV, fireplace) with exit to a small terrace, a simple kitchen (Gas, microwave, washing machine), 1 bathroom with bathtub. 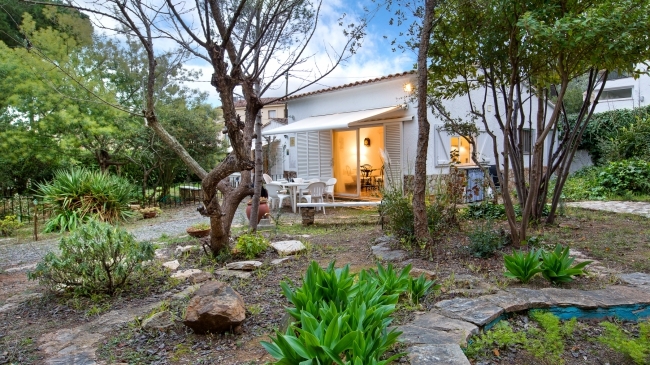 Basic bungalow located in Llafranc, just 200m from the beach and 150m from the town center, in a quiet area with easy parking. With living room (2 single beds, TV), 2 double bedrooms (4 single beds), renovated kitchen (fridge, oven, microwave), renovated bathroom (shower), washing machine. Large garden terrace. Villa located in Lloret de Mar, at 8 km from the beach and the centre of Lloret, in the quiet residencial area of Lloret Residencial. It has 3 double bedrooms (double beds) to the main floor (2 beds of 135x190cm and 1 of 140x190), living-room (TV) and direct acces to a small terrace, totally equiped kitchen (microwave, dishwasher), 2 bathrooms. Attic with library and a double bedroom (double bed of 135x190cm). It has a nice outdoor area with pool (8 x 4), private garden, porch with barbecue (fridge, microwave). Garage. (ping pong table) and 1 bathroom with shower and washing machine. Views to the mountain. Air Conditioner optional. Price in case of use it 50€/week. Free WIFI connection. Without vis a vis. Pets are NOT allowed.